Hilary Duff is a famous name in Hollywood who started as a Disney child actor and grew up to do major movies, became an entrepreneur and very accomplished writer of the bestselling novels. Hilary seems to have figured it out all, and the tattoos of Hilary surely emphasis on her cheerful and positive personality. With almost 15 tattoos, Hilary’s inks are amazing and make her looks super gorgeous. She flaunts them quite often and loves to share her tattoo’s stories with her fans. Hilary has an anchor tattoo on her left ankle. It signifies hope, stability and being grounded; we wonder what Hilary had in mind while having it. On the right elbow of Hilary, there are two tattoos. 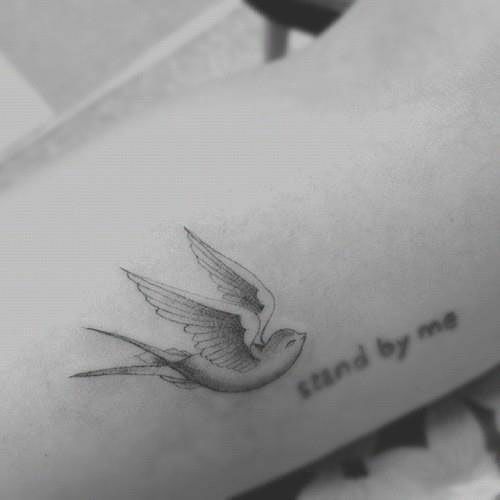 First, she got the words “Stand by me” inked and in the year 2012, she got a little bird next to that wording. 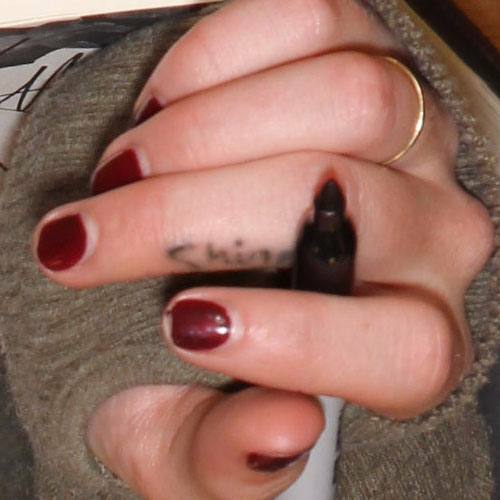 Hilary has a cute little tattoo of a red heart on her left wrist. The star surely is a firm believer for all the love she can get. Hilary got the French phrase “Ma Petite Amie” inked on her right rib cage. The tattoo is for her close friend and it means “My little friend” or “My girlfriend.” She got this tattoo with friend Leah Miller. Hilary also has a phrase “Thick as Thieves” inked on her. She claims that it means to be in a friendly manner and is close to somebody special. Hilary got the words “Let it Be” inked on her foot. In the hectic and stressed life, this tattoo reminds her that she is just one little person, so let it be. Sweet!! 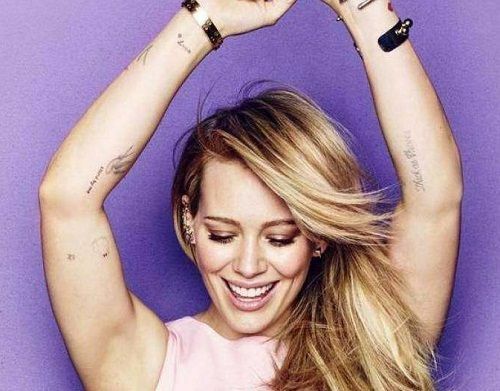 Hilary Duff got a rather cute star tattoo inked on the back of her neck. The right forearm of Hilary has a tattoo of the wishbone, and it is supposed to bring good luck and hope for better days. It seems like Hilary tattoos are all about positive vibes. Hilary got a tattoo in the year 2013 which says “2 cents” along with her friend. 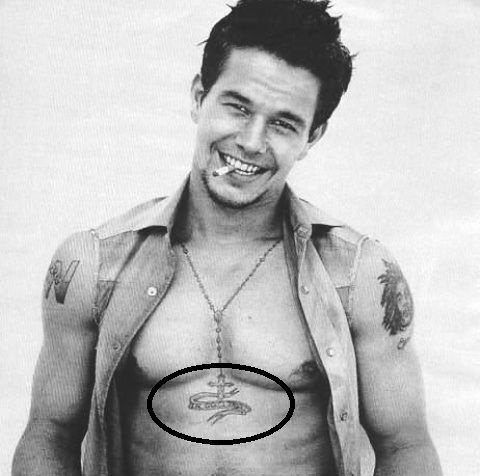 Seems like some story behind that tattoo! There is no doubt that Hilary is an awesome mom. 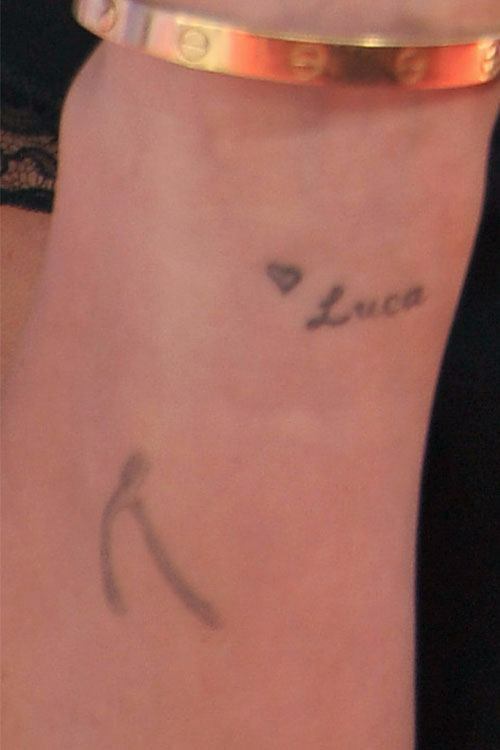 She even got her son name “Luca” inked on her wrist along with the heart tattoo. Isn’t that utterly cute!! 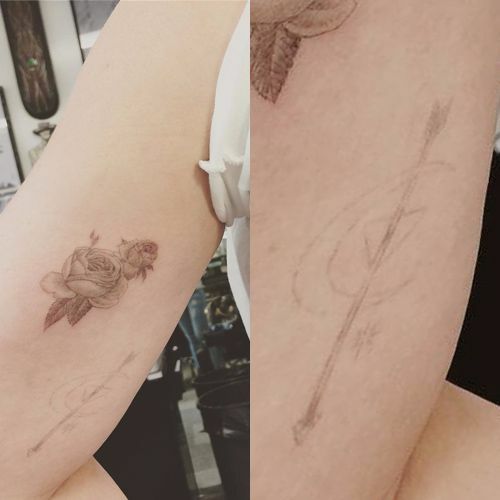 Hilary and her best friend Alanna Masterson got rather amusing and scary matching tattoos in the year 2014. 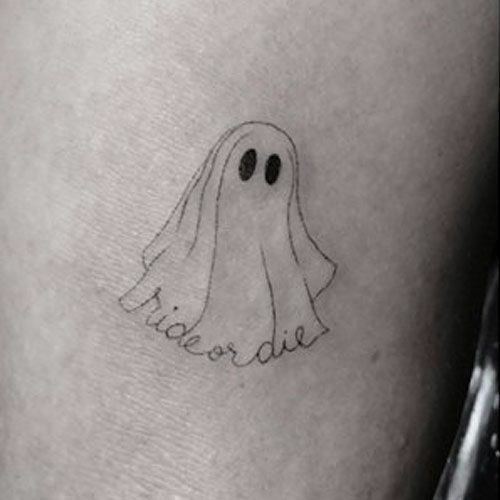 It is a ghost tattoo with words “ride or die”. Wonder what’s the reason behind getting that ink? 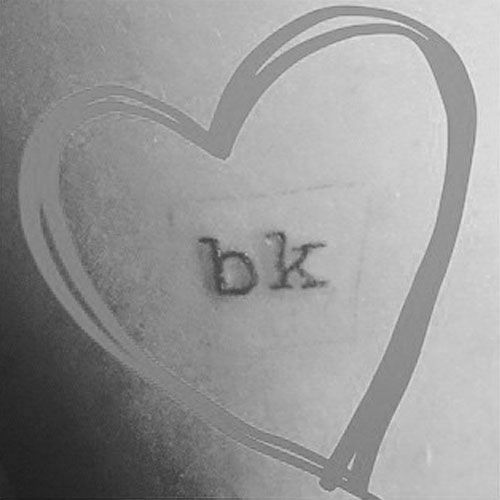 Hilary also got a tattoo with letters “bk” on her arm. It is also a matching tattoo with her good friend LoBan. Hilary has a tattoo of a crescent moon, star and a triangle cut by pointed down arrow inked on her right bicep. 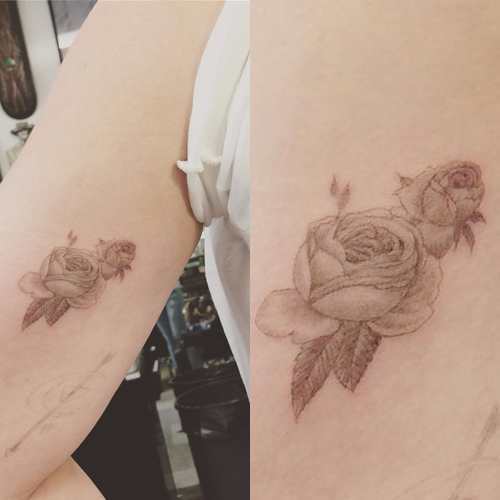 Hilary has a tattoo of the beautiful double rose in black and white inked on the inside of her right bicep. This tattoo is by famous artist Dr. 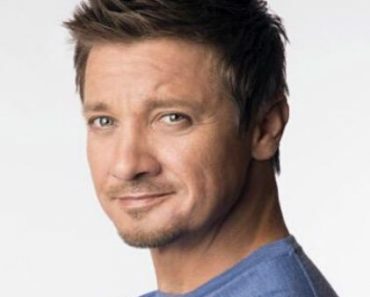 Woo.